The hip joints are ball-and-socket type joints formed by the pelvis and thigh. Various medical conditions – such as osteoarthritis, injury, old age – can cause the hip to be painful. 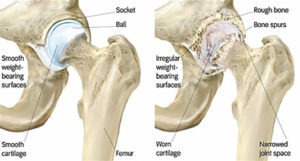 The hip joint lies deep in the body and can radiate pain to the groin, thigh, and buttock. A hip arthrogram is a precision injection which places medication into the hip joint under x-ray guidance after a dye or contrast has been injected into it. An arthrogram of the hip will produce some images which your doctor will record and then discuss with you.